As Sherwood Park continues to grow so to does its traffic infrastructure and its need for new intersections. Couple this growth with an increase in development on south side of Edmonton and one will soon understand why the demand on Sherwood park’s road network warrants expansion. The 2016 census estimates the population of Sherwood park at 70,620 and a rural population of 98,044. This number has nearly doubled since 1994. 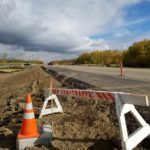 Efforts are now underway by Strathcona County to widen wye road to help accommodate the increase in volume. Alberta Transportation has also approved two new signalized intersections on Whitemud and RR232 & 231. During rush hour, making a left hand turn off of 232 or 231 onto the Whitemud was challenging at best. Construction of the new signals is currently underway by Can-Traffic Services Ltd. Once the intersections have been completed, navigating the eastern reaches of the Whitemud will be much more enjoyable. Can-Traffic Services Ltd estimates completion of both intersections before Christmas 2018. As you travel this area please keep in mind that when crews are out working, speeds have been reduced to 50Kph and speed fines double.